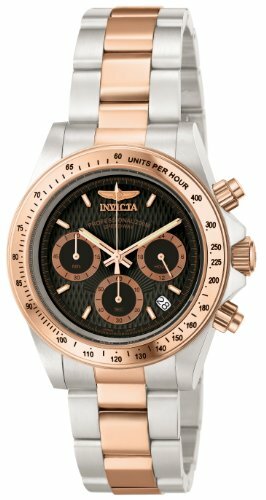 With sporty features for the modern man, the Invicta Men's Speedway Professional Collection Chronograph 18k Rose Gold-Plated and Stainless Steel Watch gets attention for all the right reasons. The round black and grey dial has rose-gold-tone stick indices to mark the hours and minutes and three matching subdials with full chronograph functionality. A subdial at four o'clock tracks the date, so you'll always be stylishly on top of your schedule. The smooth display is protected by a scratch-resistant flame-fusion crystal. The bezel is 18k rose-gold-plated stainless steel, and the casing and bracelet material is a cool combination of polished two-tone stainless steel. Secure this trendsetting watch around your wrist with a fold-over clasp. It is presented in a gift box and is water resistant to 66 feet (200 meters). Conveying time with the utmost sophistication while keeping in mind the needs of the active sportsman, the Invicta Speedway collection will effortlessly transpose into any journey. Swiss Chronograph movement, 200 meter water resistance, screw down case backs, Tritnite? luminous hands, textured dials in multiple colors are all features inclusive in these handsomely crafted timepieces. An asset to any activity, allow the Speedway to merge into your sporting and working life.